The Nissan Xterra is a compact mid-size SUV with enhanced off-road ability. It was first introduced in the market in 2001, and then it was redesigned in 2005, which is the second generation Nissan Xterra. The first generation Xterra's had a 170 horsepower 4-Liters V6 engines. The second generation Xterra's did not share a single part with its predecessors and consists of a 256 horsepower 4 liter V6 engine. Depending on the model, buyers can choose between four and two wheel drive and automatic or manual transmissions. 16 inch wheels are a standard feature for all models except SE, which has a 17 inch wheelbase. 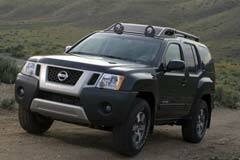 The Nissan Xterra has been a favorite SUV for a variety of reasons. The first generation Xterra is also a good bet due to its ruggedness in design and great functionality compared to the newer ones. In addition to its solid power, used Xterra's are also preferred for their cool styling and sufficient room space for passengers and their gear. 2010 Xterra 2WD 4dr Automatic SE 2010 Nissan Xterra, Navy Blue with 43166 Miles available now!